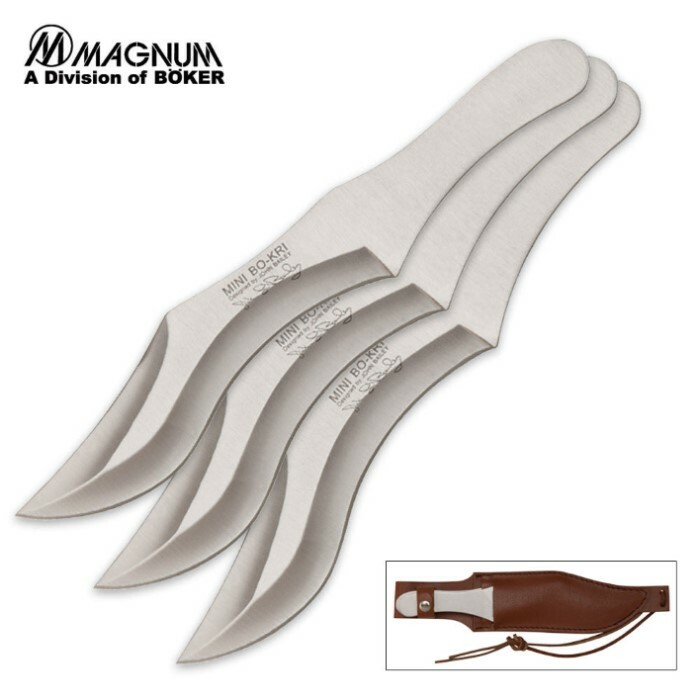 This is the throwing knife set that all professional and tournament throwers have been asking for. John Bailey's Zeil throwing knives are perfectly balanced for both handle and blade throwing, delivering maximum penetration in all types of competition targets. This is the best "tournament grade" production throwing knife set made in decades. The Zeil knives are made of super-tough thick 420J2 stainless steel with an overall length of 10 3/4", which meets or exceeds all the requirements of most knife throwing clubs. Includes a genuine leather snap sheath. THE BOKER MAGNUM 10 3/4 INCHERS THROW WELL. IMMEDIATELY THEY BEGAN STICKING TO THE BOARD BETTER THAN MOST. I'VE TRIED ALL THE HIBBENS, RUKO, SMITH WESSON, AND COLT THROWERS. THESE CARRY AN IMAGE AND A QUALITY. SURE THE HANDLE IS SMALL. BUT SOMEHOW A LOW GRIP ON THE HANDLE WILL WORK EVERY TIME. HIGHLY RECOMMEND THE BOKERS OVER THE HIBBENS . THIS KNIFE IS FAIRLY LARGE AND HEAVY. These Knives are amazing! I love the sleek curved designed. They come fairly sharp which made me nervous at first, but I quickly figured out a sharp blade on a throwing knife was perfectly fine. The fact that they were used by clove in the hunger games just made owning these knives all the more fun. They would make a great display piece because of the fact that they were in the hunger games. All in all I love them! This elegent flyer coaches the hand of the newbie and purrs like a kitten in the hands of a veteran chucker. So I guess I better justify not giving them that fifth star. I have a motto concerning throwing weapons. "Throwing weapons are ammunition not heirlooms." This is right at the high end of unit cost I'm willing to hurl. ($13/knife) But the lack the sheer weight/firepower of my similarly priced Hibben GenX. The GenX is a monster, a melted down Buick capable of punching a hole in a car hood when hurled straight, hard and true. By comparison these Baileys are lightweights with soft tips and a handle that is uncomfortably petite. The slender point is vulnerable and 1 of my 4 knives has tipped out under normal usage. In the end it boils down to not enough steel per buck and less firepower than it's.rival. LOVE THEM! I just got into throwing recently, and I bought these as part of my starter set. The unusual design is what originally caught my eye, but I have to say these are quality front to back. They've stood up very well to a clumsy amateur, with minimal nicks, dings, and no bending whatsoever. They are some big, beefy knives, but they throw very easily. Within a day I was reliably sinking them, once I'd worked out my distance and force. And man, do they stick with authority! Sheath is very nice as well, full leather with leg tie, but with all 3 knives in there, don't expect to be Quick Draw McGraw, as the fit is VERY tight. Would definitely buy again!